"If something is for you, all you have to be is YOU to receive it." This quote was the first thing I saw this morning on instagram. Immediately, I put my phone down, brushing aside the desire to scroll mindlessly for a few minutes in bed. It hit me, the sheer amount of images, and opinions I absorb daily from my phone. How could any 20-something find themselves, when they bombarded by content at all moments of the day? It is one danger of the 'gram. The ability to live so vicariously through images on our screens. I am guilty of it, I think we all are. I find myself eyeing the cool girl attending every fashion week show, with the most nonchalant attitude. I look at epic exotic world travels, and wished my paychecks could afford that lifestyle. I find beautiful faced babes booking tv shows, or sharing their sweeping accomplishments so effortlessly (with the perfect body.) Of course, inspiration is a tool for creativity. But it is a tricky line to walk, now with the constant noise of social media. It's easy to forget that self discovery is an on-going project. I have moments where I feel so unshakeable. Where I KNOW myself so fully, that no opinions could rattle my spirit. Then there are other days where I feel so far away from that spark of individuality. My anxious energy pulls me in every direction, and pushes my doubts to the front of my mind. I look outside of myself for the any answers. Listen to more podcasts, curate more images, travel to more places. It might spark inspiration, but the true me isn't something I bottle up from the outside world. I am becoming more invested in the woman I am NOW. It does not mean I cannot evolve or manifest into the woman I wish I could be. But giving the present moment the same weight as the 'will be', gives me more power to actually accomplish my most wild ambitions. I need to cherish the person I am now, and trust that what I want in life will come to me when I am ready. What's the point, if I cannot enjoy my day to day life? Finding gratitude for my home, my relationship, my family, my dog. Especially in the moments when these things aren't picture perfect or insta-worthy. I know these things to be true about myself: My relationships are number one: I am a fierce lover and extremely loyal to the people closest to me. My logical brains tries to sabotage my creativity, but my persistence will always succeed. My style and love for clothing will always be the vehicle to illuminate who I truly am. And my vulnerability will always connect me to other people and their stories- there's nothing more beautiful to that. 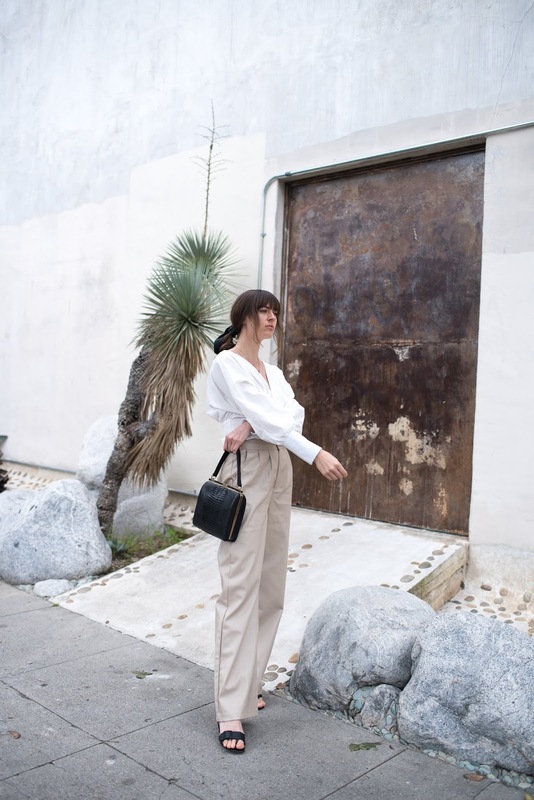 Nasty Gal Pants + Top (sold out but similar to here), Charles & Keith Shoes, Vintage Purse.